There is an interesting article in the Schumpeter Column of The Economist of 26th January. ‘As retailers abandon the high street why is IKEA moving in’. I have been pondering this since I first read it. There have been huge changes in the retail industry in recent years driven by online retail. Amazon is one of the largest companies in the world, having achieved this in a relatively short space of time. Many high street retailers have established their own online offers so that consumers do not have to visit their stores as frequently, or at all. The result of consumers moving a large amount of their purchases online has inevitably resulted in a decline of high street sales. Many businesses that were making an above average return are no longer doing so and many are now making losses. IKEA is an example of a business that has created a competitive advantage that has been sustainable. To use Michael Porter’s definition, this means achieving an above average return compared to your competitors for a period that lasts more than one economic cycle (ie about 10 years). When teaching business strategy at MTP we find IKEA an excellent example of how to create a sustainable competitive advantage. This is based on the article by Michael Porter ‘What is Strategy?’ first published in the Harvard Business Review in November 1996. Let’s first remind ourselves of what Porter identified as the reason for the competitive advantage of IKEA and then explore how the changes in the retail environment, discussed in the Economist article, may change this. According to Porter’s 1996 article IKEA targets young furniture buyers who want style at low cost. They have tailored a set of activities that created a strategic position that could not easily be copied by competitors. Rather than the offering of a traditional furniture store, IKEA does not have sales staff following customers around the store but uses a self-service model. Rather than relying on third party manufacturers, IKEA designs its own low-cost, ready-to-assemble furniture. Customers do their own selection of furniture from the warehouse and deliver it to their home themselves. Extra services are offered that are appropriate to their target market including instore childcare and extended opening hours. This position is shown in the image below (a slightly modified version of one I saw presented by Michael Porter in London more than 15 years ago). The reason why the competitive advantage of IKEA has been maintained for so long is that they are able to keep their costs below those of competitors (even those who try to replicate a low-cost approach) through economies of scale. Since they sell only their own design of furniture, and they sell huge volumes, the design cost per unit is very low. Like, I imagine, many people who are reading this I have a number of ‘Billy’ bookcases from IKEA in my house. The design cost of these, when divided by the total number of units sold, is very small. Will the changes identified in the Schumpeter article lead to a decline in the competitive advantage of IKEA? IKEA is opening new stores in different locations. Some, such as the one on Tottenham Court Road in London are showroom only. Customers will view merchandise here but either order in the store or later online. 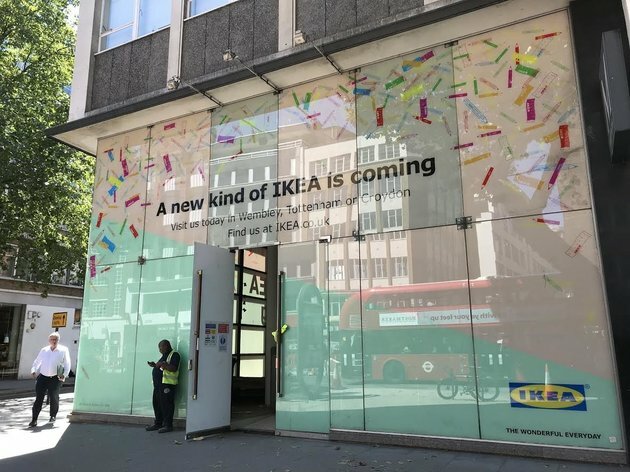 According to Schumpeter, IKEA is planning to open 30 stores in city centres with Paris and New York being two more targeted locations. Delivery will become much more critical to their success and IKEA is devoting a lot of attention to this. IKEA will ship more products to customers’ homes. The increasing move to online sales is highly likely to increase this. If IKEA needs to deliver a higher proportion of goods sold they will do so from new stand-alone warehouses. However, in addition to this they will be able to source products for delivery by IKEA to customers from their large suburban stores. Another innovation will be achieved through the acquisition of a business called TaskRabbit, which will offer a service to assemble the furniture customers have purchased. This has been offered by independent operators informally for a number of years, particularly in the US, but IKEA is now planning to integrate it more in to their core offer. As we have seen, a key advantage for IKEA is offering furniture that customers find attractive at low cost. Spreading the design cost over a huge number of units sold is key to this. They have the advantage that the furniture they sell appeals to customers from many different groups and many different countries. If they can manage to continue to achieve this we believe they will continue their success. The danger is perhaps that they try too many new ideas such as smaller stores with merchandise changing more frequently. Here is an area where they seem to have little competitive advantage against much smaller, and perhaps more nimble, competitors. A further issue, not considered in the Schumpeter article, is raised by IKEA’s expansion into more countries. While their competitive advantage in mature economies, such as the USA and Europe, is well designed furniture at lower cost than competitors, this is less of an advantage as they move to developing countries such as India and Indonesia, where there are local producers of furniture often selling at prices below those of IKEA. The attractiveness of their design therefore assumes a greater importance in these new areas of their operation. Will IKEA’s competitive advantage continue to be sustained as the retail environment changes and they expand into new markets? As always, we will see. Read the original Economist article here.